Broome Manilamen descendants with Dee Hunt and Deborah Wall. L-R: Dee Hunt, Juanita Gower, Evelyn Masuda (dec), Theresa Barker (dec), Ellen Puertollano, Mary Manolis (dec) and Deborah Wall. Broome, 2008. Zarcal, a pearl diver recruit in Australia’s booming pearling industry in the 19th century, was mentioned in Philippine textbooks as “the 1898 Philippine Revolutionary government’s ‘diplomatic agent’ in Australia.” Around that time, challenges to Spanish colonial rule impelled some natives in the Philippines to leave their country to escape the political upheaval. Like Zarcal, other recruits were actively involved in supporting the Filipino revolutionary struggle against Spain. On Thursday Island, Zarcal’s own political sentiment could be inferred from the name that he chose to give his building. “Manilamen” pearl divers Candido Iban and Francisco del Castillo returned to the Philippines after a stint working in Australia. On their return, they joined the underground revolutionary movement. Del Castillo was appointed chief of the Katipunan chapter in Capiz, with Iban as his assistant. Years later, I heard that a musical band from Broome, the Pigram Bros., were scheduled to perform at Woodford Festival in Queensland. The Pigram Bros. I found out were descendants of a Manilaman pearI diver who married a part-Aboriginal woman and stayed. I flew into Queensland in 2007 to meet the members of the band after their performance. I interviewed them for an article and asked if they could help introduce me to the community. I wanted to find Filipino-Aboriginal descendants of Manilamen willing to narrate their stories in my personal oral history project. By then, I had already successfully completed three oral history projects involving Aboriginal and Filipino people in Sydney. In 2008, I stayed in Broome for three months to get to know the descendants and found the community welcoming. Shortly after my stay, a friend from Queensland, Dee Hunt, editor of Kasama (a Philippine-Australian online publication) joined me for a little while to help with documenting the descendants’ stories. My project, however, was interrupted by a postgraduate course that I had to finish. Upon finishing my PhD about the controversial gas development proposal in Broome, I returned to Broome in 2015 to finish my oral history project. I updated the stories I had gathered in 2008 and extended the project to include Torres Strait Islander descendants of Manilamen. I was joined in Torres Strait by friends from Sydney on my visit to Hammond Island, Horn Island and Thursday Island. My friends Robyn Hutchinson, a retired school principal and Denise Barry, a Sydney artist, came to help me document the descendants’ stories through art impressions and photographs. When the transcripts of interviews were done, a historian from Western Australia, Dr Christine Choo, and I examined the descendants’ stories. We found deeper insights into how Australia and the Philippines were intimately connected through the Manilamen’s Australian Aboriginal and Torres Strait Islander families, whose voice came from standpoints three to five generations since the arrival of their forebears. The seafarer recruits from the Philippines were called Manilamen although they did not necessarily originate from Manila. Manilamen were part of a global class of workers who crewed vessels that linked the Philippines to Asia, Africa, the Americas, Australia and Oceania. From this point of view, “globalisation” is actually an old phenomenon. Historian, Filomeno V. Aguilar Jr. referred to Manilamen seafarers who served as mercenaries in 1818, when a Frenchman, Hypolite Bouchard, led two ships in a siege of Monterey, California in a bid to liberate California, then a possession of Spain ruled through Mexico. Bouchard’s crew included Hawaiians, Americans, Spaniards, Portuguese, Creoles (Mexicans), Malays, Englishmen and Manilamen. In 1819, British Singapore was founded as a free port. It served as an important node in the global maritime network in which Manilamen circulated. In the 1891 census, Manilamen, Chinese, Boyanese Bugis, Dyaks and Javanese fell under the broad classification of “Malays and other Natives of the Archipelago.” Between 1800-1850, trade routes between Australia and Asia brought hundreds of sailing ships from Brisbane and Sydney through the Torres Strait and to ports in India and other parts of Asia. Goods from the Philippines made their way to Australia through the British colonies of Singapore and Hong Kong when the Philippines opened to international trade in 1834. Trade connection between the colonies of Australia and the Philippines began in the early part of the 19th century. At the time of the Manilamen’s arrival in Australia, the political climate was not conducive to giving Asians and Aborigines equal rights with European settlers. When Zarcal arrived on Thursday Island in 1892, he was only 28 years old. His desire to become naturalized as a British subject was part what Aguilar calls “instrumental citizenship.” Without becoming a British subject, Zarcal would not have been able to own luggers and schooners and would have been restricted to being a diver or a member of an Asian crew. The political climate deteriorated for Asians and Aborigines. A law was passed, the Aborigines Protection Act, WA 1886, which appointed Protectors of Aborigines and given wide powers to intervene in the lives of Aboriginal people with respect to the care, custody and education of their children. Magistrates were empowered by the Act to apprentice Aboriginal children to work to the age of 21 years. In the same year, the Sharks Bay Shell Fishing Act was passed, giving the Governor discretionary power to refuse Asian applicants a pearling licence, effectively excluding them from the lucrative industry from becoming lugger owners and entrepreneurs. In 1901 when Australian British colonies became one nation, the Immigration Restriction Act was passed introducing the “dictation test” and stringent criteria for the entry of immigrants into the country. In 1905, the Aborigines Act barred Aboriginal people’s access to towns between sunset and sunrise, forcing them to live in reserves outside towns, and giving the Chief Protector the right to remove Aboriginal adults to any district if he believed it was in their interest to do so. This Act also prohibited co-habitation between Aboriginal and non-Aboriginal people. These laws affected Manilamen descendants and their Aboriginal and Torres Strait Islander families. Before Federation, some Manilamen were more easily able to obtain naturalization. After Federation, the descendants had a much harder time. 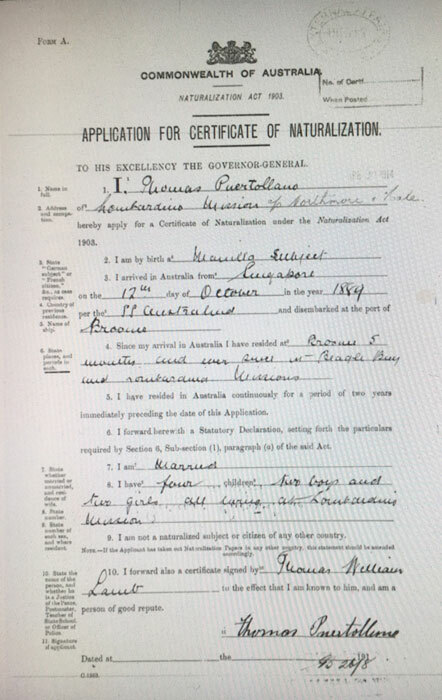 Thomas Puertollano’s application for naturalization was denied because he was ineligible to apply being “an Aboriginal native of Asia.” Thomas, a Manilaman recruited from Singapore, was the great grandfather of Kevin Puertollano. Despite the high regard for Thomas in the community in Broome and the positive references he was given by European leaders of high standing, Thomas still failed to obtain naturalization. He died an alien in 1942. Another Manilaman, Agostin Cadawas, the paternal great grandfather of Josephine Petero-David from Hammond Island, was issued a Certificate of Registration of Alien. This certificate enabled authorities to track down aliens’ change of residence. Perhaps because Manilamen like Agostin were known to authorities as having families with locals in remote regions, the state had not bothered with deportation orders. Telesforo Ybasco, the father of descendant Magdalene Ybasco was considered an “unnaturalised alien.” Under the Pearling Act, it was illegal for an unnaturalized alien to engage in pearling operations. Consequently, the case he mounted against his British business partner in the pearling trade was dismissed. Aborigines, Torres Strait Islanders and Asians and their progeny experienced institutional challenges with their rights legally constrained. Manilaman descendant Ester Corpus’ first application for naturalization was declined. It took a second application 27 years later, in 1946, for her application to be approved. Her success might have been due to the recommendation of the Protector of Aborigines in Broome. The Protector recommended that her application be granted on the grounds that: she had dissolved her native associations for two years except with respect to lineal descendants of native relations of the first degree; she had adopted the manner and habits of civilized life; she did not consort with natives; she did not visit the camps of native relatives or vice versa; her children did not consort with natives; she occupied a dwelling house; and she was of good character, industrious habits and reasonably capable of looking after her own affairs. The Manilamen descendants’ experience of settlement in Australia provides a glimpse of how Australia’s social, economic and political history evolved. The stories we gathered from the descendants ended up as a book entitled Re-imagining Australia: Voices of Indigenous Australians of Filipino descent published by Keeaira Press in 2016. In September 2016, we had our first book launch in Broome, Western Australia followed by a book launch and exhibit at the Cultural Center of the Philippines (CCP) sponsored by the Australian Embassy and the CCP. A few descendants who attended the Manila book launch afterwards embarked on a journey to reconnect with their Filipino ancestry. 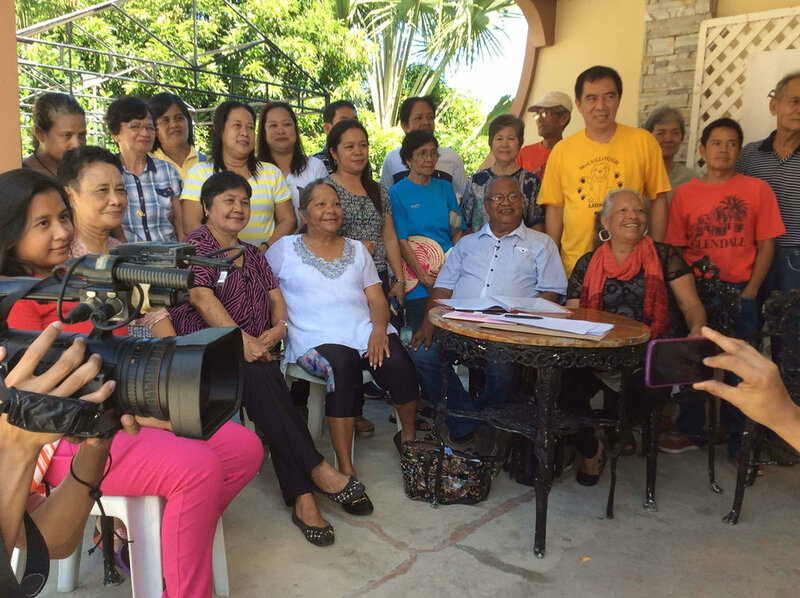 Manila’s GMA, I-Witness TV crew documented the descendants’ journey on the island of Marinduque and followed the visitors on their return to Western Australia to carry out a more in-depth documentary of the Philippine-Aboriginal historical and ancestral connection. The documentary GMA produced is called Manilamen (accessible on YouTube). 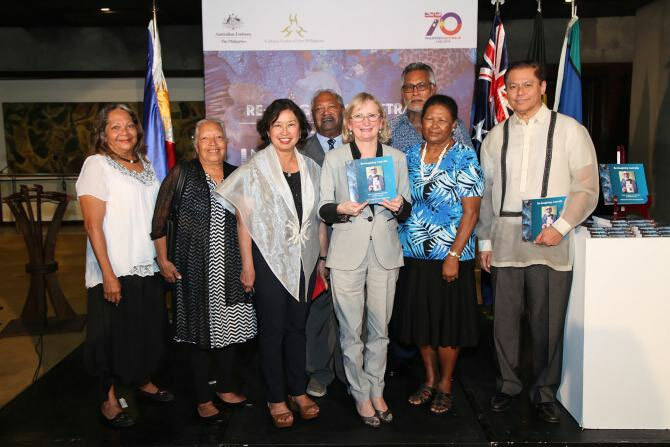 In November 2016, the Philippine Embassy and the Australian Government Department of Foreign Affairs and Trade also sponsored a book launch and put together a new exhibit in Canberra to mark the 70th anniversary of the diplomatic ties between Australia and the Philippines. This exhibit was toured in Broome during Shinju Matsuri, an annual Festival of the Pearl celebration commemorating the contributions of multicultural Asian and other people’s history in the old pearling town. The third exhibit is now held at the Western Australian Maritime Museum from 8 Dec 2018- 3 Feb 2019. We received positive feedback from book reviews. 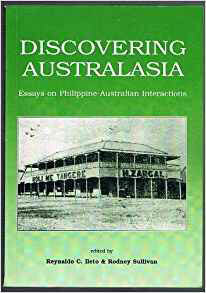 A reviewer remarked that the stories of Australian Filipinos had not been very well documented until recently. Another wrote that this collection of life stories fills a gap in Australia’s social history. One comment was that the book approached history from various angles, combining detailed oral histories with meticulous research from archives and newspapers and that the layering of family history, memory and creativity reflects the generous community spirit in which the work has been undertaken. 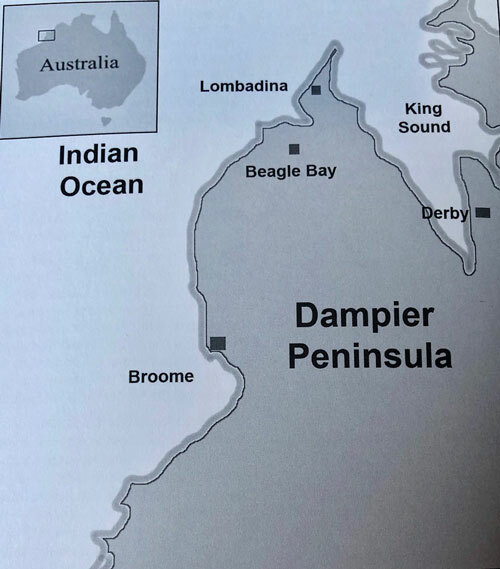 Another reviewer noted that the descendants’ stories show how the lives of their forebears were often ones of resistance and resilience in times when citizenship was a long way off for both Aboriginal Australians and Filipino migrants. The book was also praised for being visually beautiful with a number of previously unpublished photographs from family collections. Most of the people here eat rice. They all eat rice. They’d rather eat rice than bread. ‘Cause they, the Filipinos brought it here in the early days -- rice! — Anthony Ozies from Broome. I used to argue with my son-in-law ‘cause one day, we were talking about dinuguan, and I said to him, “No, that is a Filipino dish.” He said, “No, this is an Island dish!” —Lilian Elarde Majid from Horn Island, Torres Strait. The strongest thing that came through from that culture was the gathering of family, being strong in the faith of the community, Catholicism, the sharing. The music talent was passed down, the love of dancing, the love of gathering, and eating food together — Mitch Torres from Broome. I know I have been asked many times if I am a Filipino or an Aboriginal. Well, I can’t help myself. The Filipinos came here and they had an influence in the place, and I’m me. I can only be me — Kevin Puertollano from Broome. Deborah Ruiz Wall, PhD OAM is a Filipino Australian born in Manila. Her completed oral history projects included Aboriginal and Filipino women in inner city Sydney, Western Sydney and Aboriginal and Torres Strait Islander Australians of Filipino descent in Broome, Western Australia and Torres Strait.